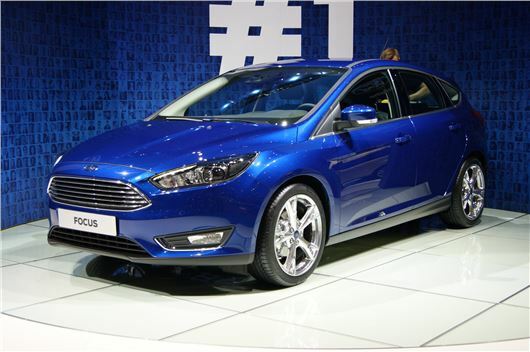 The Ford Focus facelift has been shown at the Geneva Motor Show. The restyled, improved Focus will be available to order from mid-2014 and is expected to be priced at the same level as the current model, which starts at £13,995. Furthermore the 1.0-litre EcoBoost has been improved, meaning emissions now come in at below 100g/km – previously only diesel versions of the Focus qualified for free VED. This means lower Benefit in Kind for company car drivers who pick the petrol. Ford says it's the first petrol-powered non-hybrid in its class to come in at under 100g/km. There’s also an improved interior, which features a more user-friendly and less cluttered centre stack. The new design has a simple and intuitive layout. Material quality is better, giving the car a more upmarket ambience. The refreshed car gets a neater look – the grille is much like that seen on the Ford Fiesta, while the headlights are slimmer and more simply styled. At the rear the car’s styling has been tidied up, with more elegant lines. The tail lights have been tweaked with a slimmer design. Another important improvement is the addition of the latest version of Ford Sync infotainment, which has much improved voice recognition and a large, clear, responsive touch screen. The system is easy to navigate and lets you control most functions easily with few button presses. The voice control is particularly impressive – it’s been designed to understand commands spoken in a more colloquial, human way. You can simply tell the car you are hungry and it will start to search for restaurants, or you can tell it part of a song name and it will understand and fill in the blanks for you. Technology has been improved, with a better park assist system to help drivers in and out of parallel or bay spaces. This is complemented by cross traffic alert, which warns of vehicles approaching in blind spots when reversing out of a driveway or parking space. The restyled, improved Focus will be available to order from mid-2014 and shouldn’t be any more expensive than the current model which starts at £13,995. Any news on the co2 and 0-60 times for the new 1.5 engine? The new focus look's great, i can't wait to see the new st, i hope its got more power?. On the co2 , co2 is not an issue, it is not a pollution.we need co2 its life on earth,plants, trees and crops need it to grow and they give us our oxygen.starve the world of co2 and plants , trees and crops will die.